I'm not sure how this particular combination of ingredients came about, but it really works and is always a hit. I always seem to make these around the holidays, and because they are great to make ahead and freeze, they can be kept on hand for busy nights, unexpected company, or potlucks. If you have time to make your own dough, obviously that would be better, but since the purpose of these is to make them as a time-saver, I use frozen ready-made tart shells. I will be taking a break for the holidays, so I will see you again in the new year. 2. 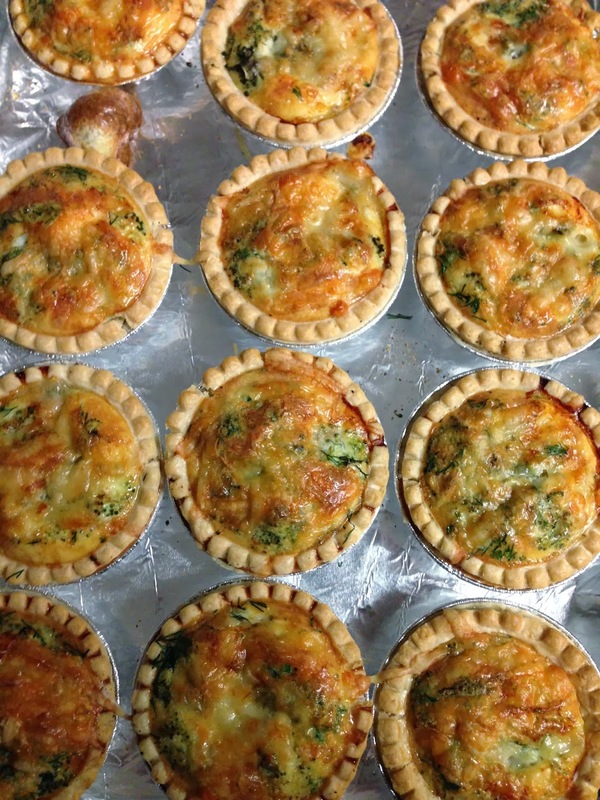 Separate the tart shells and put them on a baking sheet to thaw while you prepare the other ingredients. 3. Chop the broccoli, onions, shrimp, and dill. Shred the cheese. In a separate bowl, beat the eggs, salt, pepper, and cream. 4. 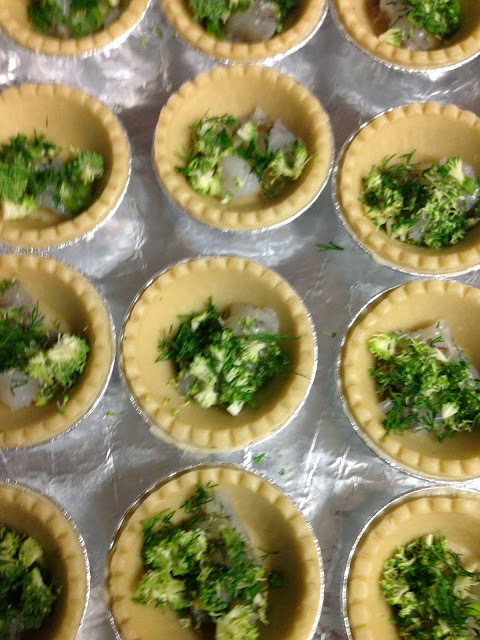 Divide the broccoli, green onions, shrimp, and dill between the tart shells. 5. 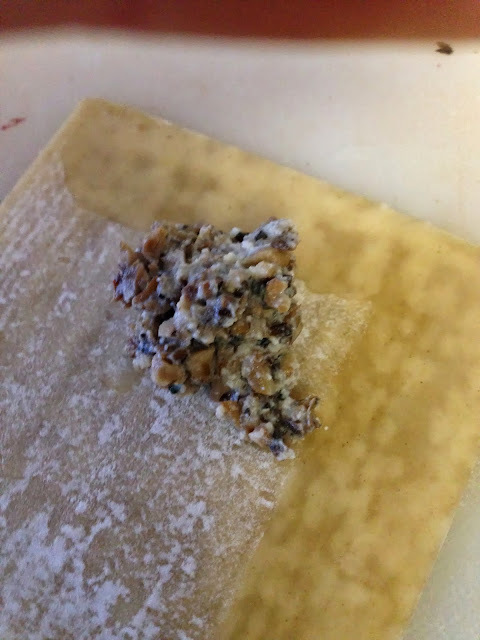 Pour the egg mixture into the shells being careful not to over fill. 6. Top each tart with a bit of shredded cheese. 7. Bake in the oven for about 40 minutes until golden brown. 8. Let cool for about 5 minutes before serving. These are great warm or even at room temperature. If they are frozen, they can be reheated in the oven or microwave. Enjoy! 1. I use Tenderflake tart shells because they bake the best. 2. I also use raw shrimp as opposed to cooked. Do not use canned. If you can only find medium-sized shrimp, use 10 instead of 6. 1. This can also be made with asparagus instead of broccoli. 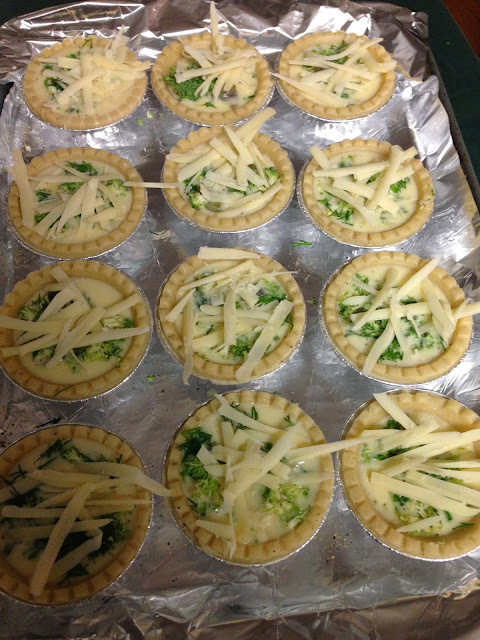 You can add the asparagus as well as the broccoli if you want. 2. Serve a few of these with a side salad for a quick meal or on their own for a satisfying snack. Whether you are making these for your family or for guests, they are sure to become a tradition in your house as they have become in mine. When I was a kid, one of the things my dad looked forward to when visiting his parents was his mom's famous cabbage rolls. We didn't live in the same city, so every couple of years when we would visit, you could be sure that cabbage rolls would be on the menu. As excited as he was, I secretly hated them. Grandma's house was the only place we ever ate them, and the sour cabbage was an assault on my undeveloped palate. Since that time, I have grown and so have my tastes. Cabbage rolls are now one of my favourite foods, but I don't have the time or patience to make them, and Grandma lives three provinces away (I don't think she's made them in quite a while, either). One night, I had a mad craving for some cabbage rolls, so I called my mom to see if she had the recipe for Grandma's special sauce. I thought I would buy some frozen cabbage rolls, and then just make some sauce to bake them in. Imagine my surprise when I found out that Grandma's special sauce is condensed tomato soup and ketchup! 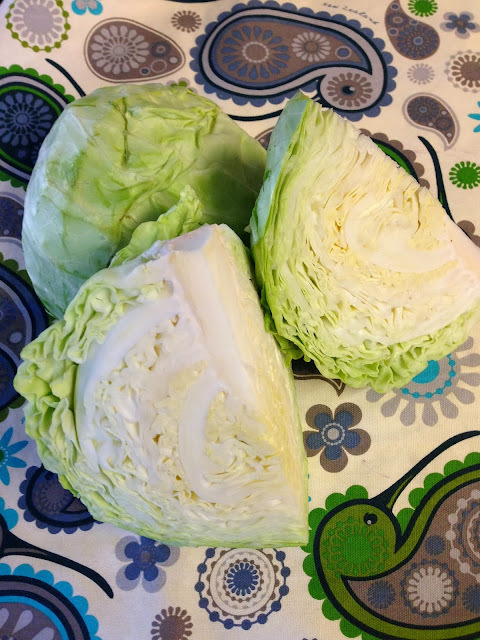 This recipe is my attempt to harness the taste of those famous cabbage rolls while skipping the labour intensive rolling step and making a few substitutions in order to increase the health factor. This will serve 6 - 8 people. 1. Saute onion in canola oil with a pinch of salt until translucent and golden. Add grated carrot. 2. Add paprika, garlic powder, sugar, passata, diced tomatoes, chicken stock, barley, sauerkraut, sausage. Bring to a boil. Lower heat and cover. 3. Simmer until barley is tender and sausage is cooked through, about 30 - 40 minutes. 4. 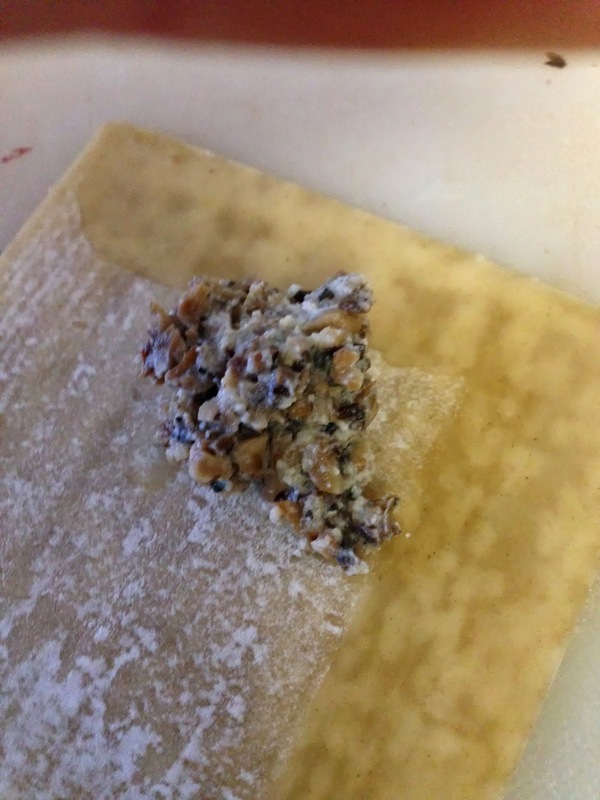 Remove from heat, add milk, and salt and pepper to taste. 5. If you can leave it until the next day and reheat it, it will be even better. Enjoy! 1. Passata can be found in Italian markets, but I have also found it in grocery stores near the pasta sauce. 2. Make sure you buy plain diced tomatoes, not the ones that have added seasonings. 3. Sauerkraut comes in two forms: naturally fermented and pickled. The way to tell the difference is to look at the ingredients. 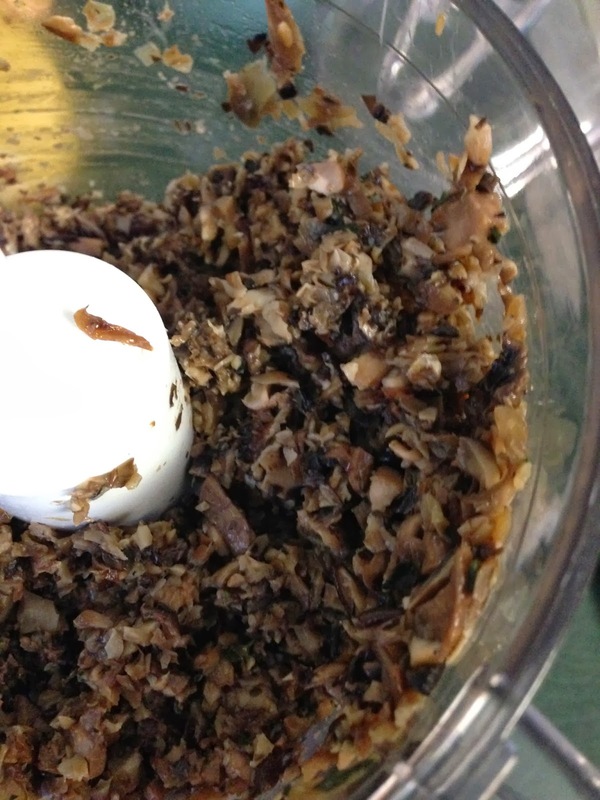 If it is naturally fermented, the only ingredients will be cabbage and salt. I prefer this kind because the natural fermentation process produced beneficial bacteria that aid in digestion and health gut flora. The pickled kind will list vinegar as an ingredient. 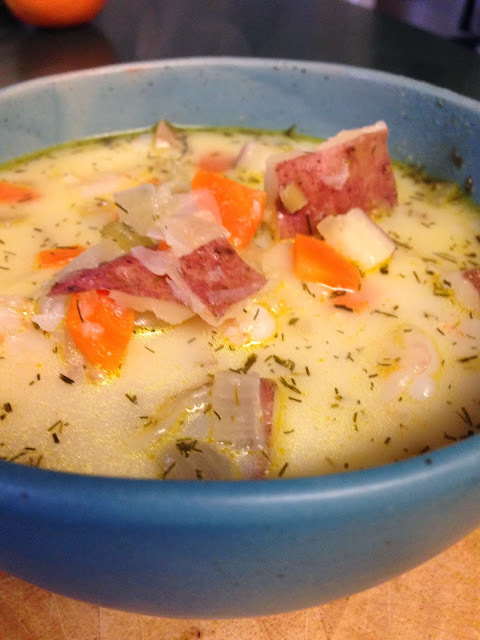 This soup would make a great addition to any holiday table. Bring it to a pot luck or serve it for Boxing Day supper. It is easy to throw together and is better made ahead of time. I've previously posted my favourite Summer Fresh Pasta, so you are all familiar with one of the most popular dishes on our dinner table. 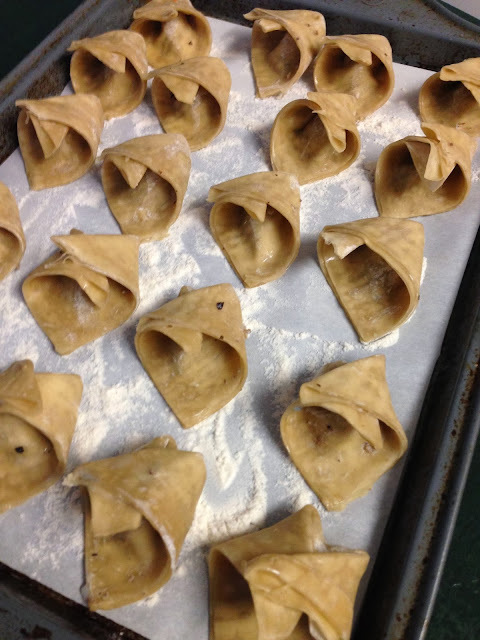 However, even favourites run their course and eventually everyone gets sick of them - cue the new winter fresh pasta. 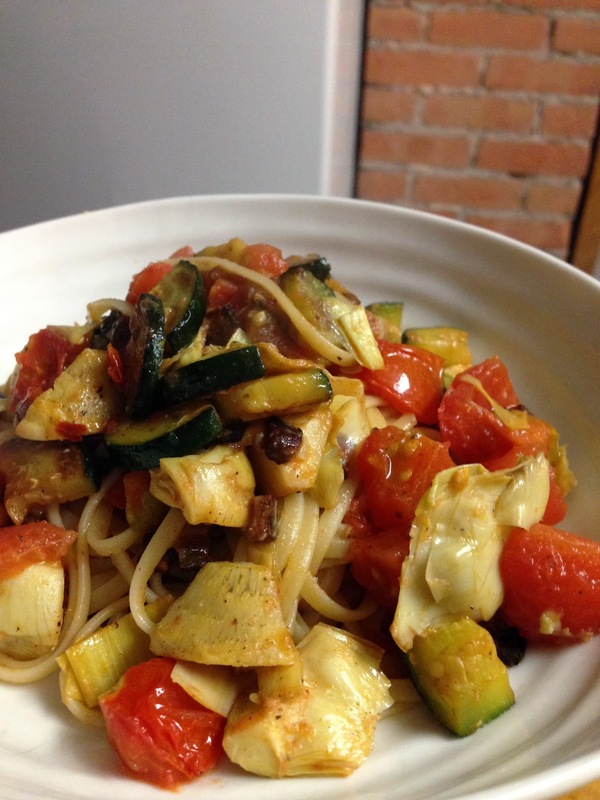 One of the things I like most about the summer pasta is that it is quick and easy to make and includes lots of vegetables. So, I took the same idea a just tweaked it a bit. This recipe does include bacon instead of cheese, but it's only one slice for two people, so it's definitely in moderation. Just enough to give the bacon flavour without overpowering everything. 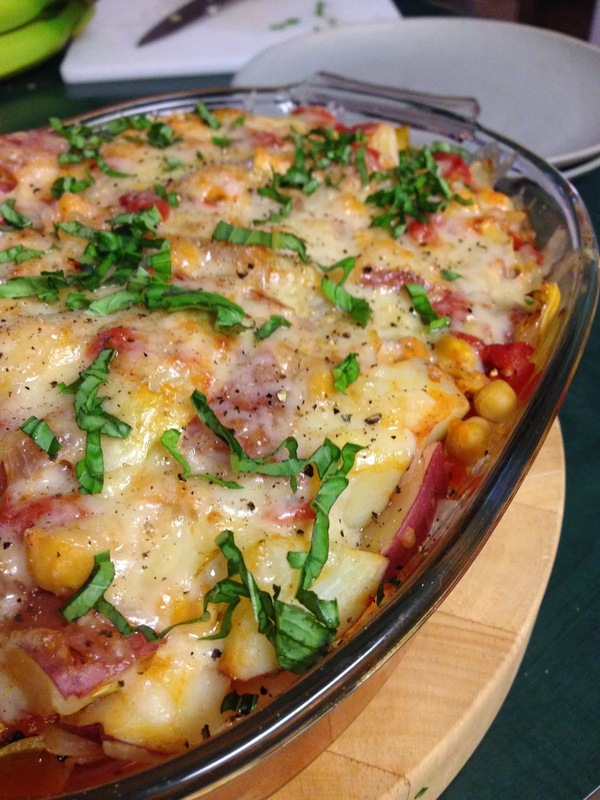 This dish serves two people as a meal or four as a side dish. 1. Put salted water on to boil in a large pot for the pasta. 2. Fry the bacon over medium high heat for about 4 minutes. Do not add any extra oil to the pan, the bacon will release a lot of fat momentarily. 3. Add the chile flakes and the zucchini as well as a bit of salt and pepper. Sauté for about 8 minutes. Once the pasta water is boiling, add the pasta and cook according to directions. 4. 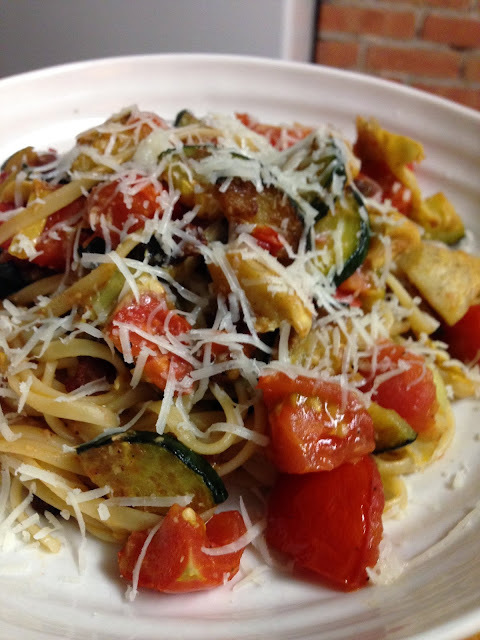 When there are about three minutes left in the cooking time for the pasta, add the artichoke hearts, garlic, and tomatoes to the zucchini. Add more salt and pepper to taste. Sauté until the tomatoes have released their juices and created a sauce. 5. Drain the pasta and add it to the veggies. Portion into bowls and top with parmesan cheese and fresh basil if available and desired. 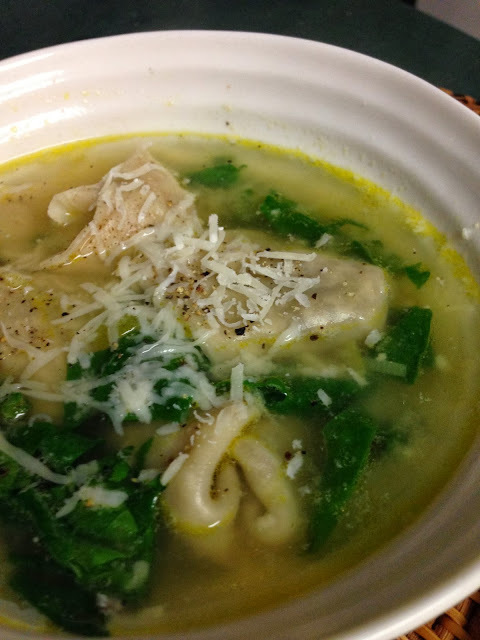 Basil is really more of a summer herb, but sometimes you can find it in the winter. Enjoy! 1. It is really important to buy cocktail tomatoes. First of all, in the winter, the other ones are disgusting and have no taste, and second of all, they have a lot of juice, which is what creates the sauce. 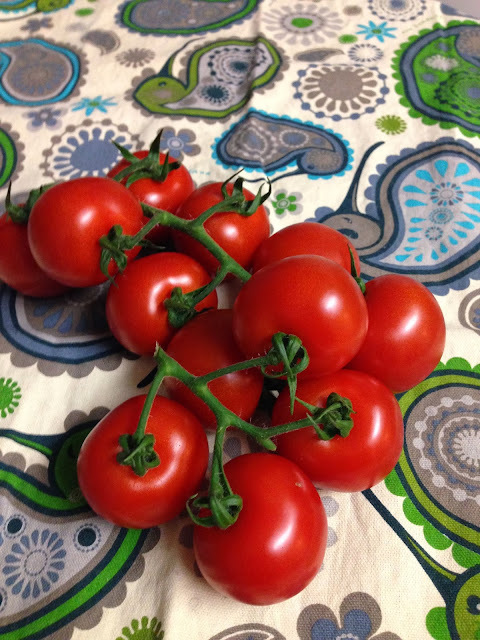 Other tomatoes, especially Roma tomatoes, have less juice and will leave you with a dry pasta. 2. Do yourself a favour and buy your bacon from the Farmers Market. The taste difference is incredible, and once you've tried it, you will never go back. I rarely use bacon, so I splurge on the good stuff, wrap it up in small quantities and freeze it. For this recipe, you can cook it right from frozen, so there is no need to worry about defrosting it. 1. You could add kalamata olives to this is you wanted to take it even further into the Mediterranean. If you've tried out any of these recipes, I'd love to hear what you think. Please drop me a line in the comments section and let me know. Thanks! Every morning for breakfast, I eat avocado on toast. 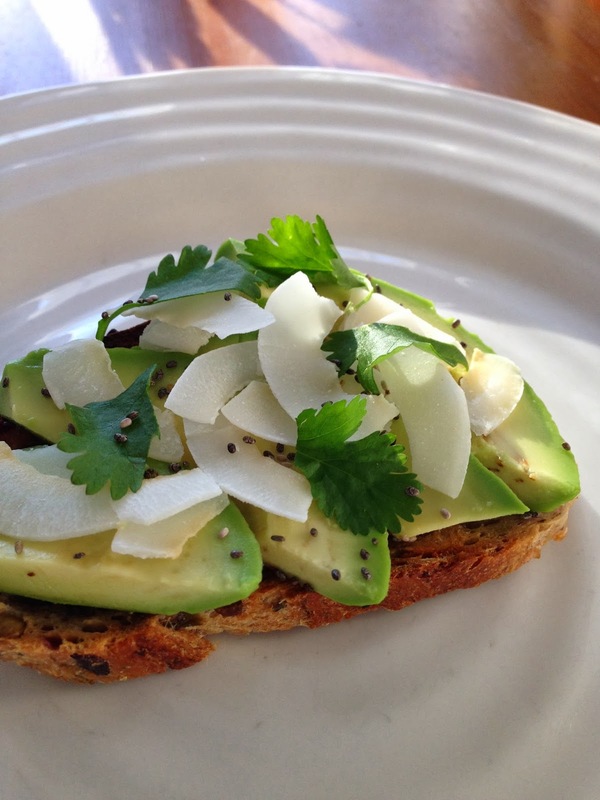 There are a couple of different variations, but two things always remain the same; avocado and toast. Breakfast is one of the most enjoyable parts of my day. The house is quiet, everyone has left, and I get to sit with my toast and tea and watch all the dog walkers out my front window. I occasionally watch old episodes of River Cottage on YouTube as well (a guilty pleasure of mine...). I didn't use to eat breakfast, but after travelling to New Zealand and being served breakfast every morning from the families I was staying with, I came to realize what an important part of the day it is. When I tried eating breakfast in the past, it was never satisfying enough, so I just ended up snacking or being hungry. But, avocado on toast is so filling that it keeps me full until lunch without need for even a morning snack. The chia seeds in this recipe are great for Omega-3 fatty acids and antioxidants. They are also full of fibre and help to keep you fuller longer. One of the most important parts of this meal is the bread. It is very important to pick a hearty whole-grain preservative-free loaf. 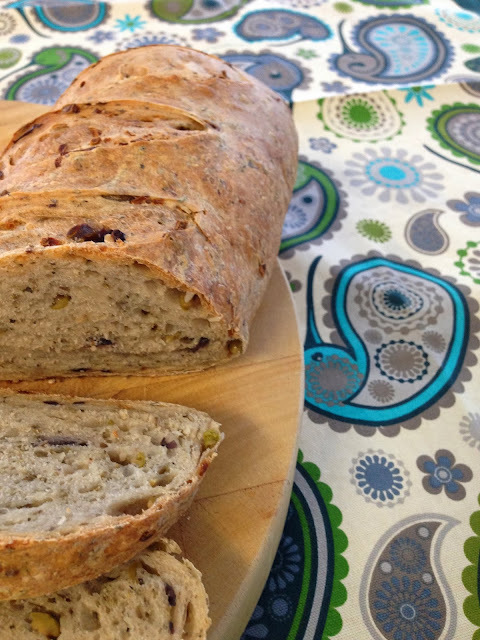 If you are lucky enough to live in Edmonton or Calgary, you have a Prairie Mill Bakery that sells amazing loaves with different daily specials. If you live in a different city, seek out real bakery bread - it is more nutritious and more filling. 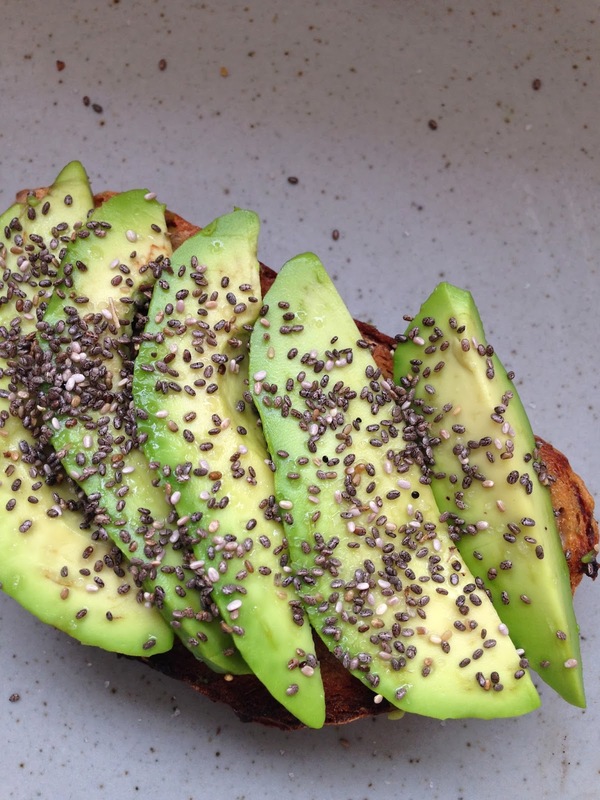 Toast bread, slather on butter or mayo, top with avocado slices, sprinkle with chia seeds, salt and pepper. Toast bread, slather on coconut butter, top with avocado slices, sprinkle with chia seeds, add coconut, cilantro leaves, salt, and pepper. I realize that this is not much of a recipe and is more of a list of ingredients, but believe me, if you try it, you will love it. Personally, I'm addicted. 1. Sometimes instead of butter or mayo, I will use cashew cream to lighten the calories and make it vegan. To make cashew cream, soak 1/2 cup cashews in water for 4 - 8 hours. Rinse. Puree in a blender (or "bullet") with 1 Tbsp olive oil, 1 Tbsp apple cider vinegar, 1 Tbsp lemon juice, 1/8 tsp salt, 1/8 tsp onion powder, a pinch of cayenne pepper, and a splash of water. Add enough water to make it the consistency you want. It will last in the fridge for about five days. 1. Buy avocados 2 - 3 days before you will need them. They are ripe when they are just starting to give. Cut the avocado in half around the pit and then twist to separate. Hit the pit with the heel of your knife and twist to remove the pit. Cut the half into quarters and peel the skin off. If you are only going to use half of the avocado, keep the half with the pit in it in a container in the fridge to keep it from going brown. A friend of mine was able to grow 61 (!) squash in her garden this past summer. So, it came as no surprise when she asked me if I would like some. What I didn't know was that I was soon to be the unsuspecting recipient of an entire cloth shopping bag of squash. Fortunately, though, many of the squash she gave me were delicata squash, which are now my favourite winter squash. The nice thing about them is that they are small, so you won't always have leftovers, and you don't need to peel the skin off them. This winter salad was inspired by a recipe from the Barefoot Contessa and feeds four. 2. Cut the squash in half lengthwise and scoop out the seeds. 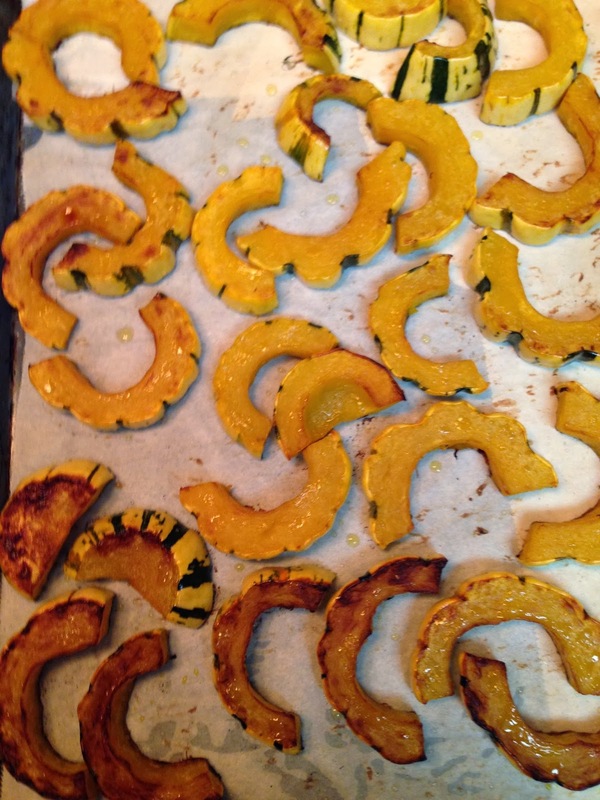 Cut the squash into half-moons, toss with oil and salt and place on a parchment covered baking sheet. 3. Roast for 15 minutes, turn and bake for an additional 10 minutes. Browning is good. Let cool to room temperature. Cut each ring into three pieces. 4. 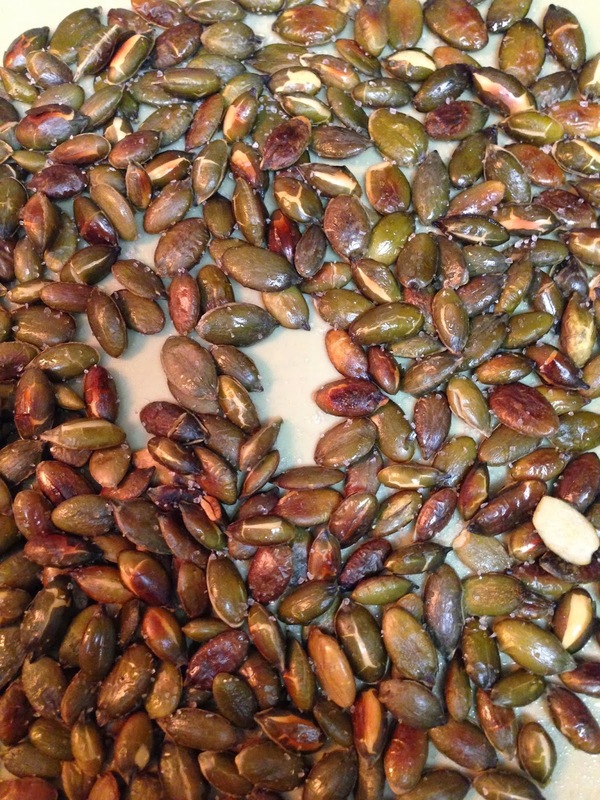 In a dry skillet, toast pumpkin seeds until they start to pop. Toss in a small amount of olive oil and sprinkle with salt. Let cool. 5. 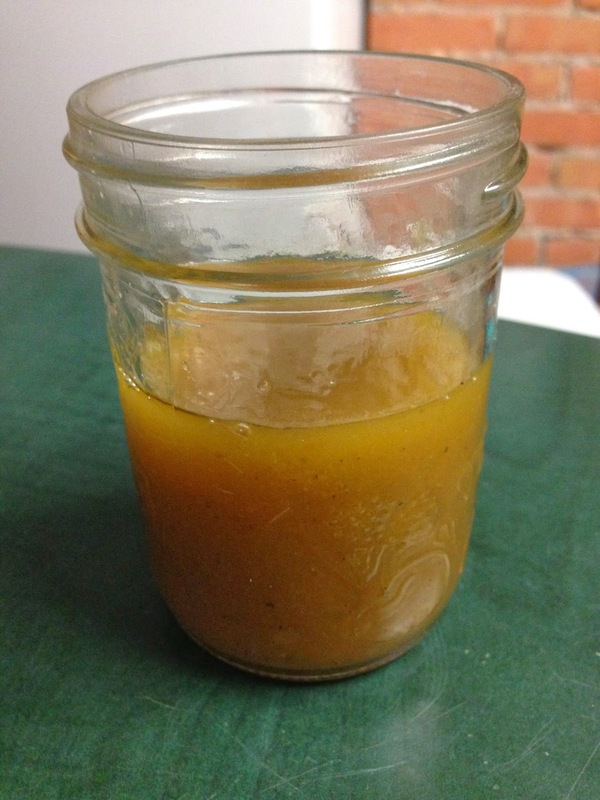 To make the dressing, combine apple juice, maple syrup, shallots, and vinegar in a small sauce pan. Boil and reduce until you have about a 1/4 cup worth. Remove from heat. Add mustard, salt, pepper. Whisk in oil in a thin, steady stream. 6. On a platter, arrange the lettuce, squash, feta, cranberries, and toasted pumpkin seeds. Drizzle dressing over top. Enjoy! 1. Delicata squash can be found in some grocery stores in late October, early November. 2. Dried cranberries and sometimes pumpkin seeds can be found in the bulk section, so you don't have to buy more than necessary. 1. 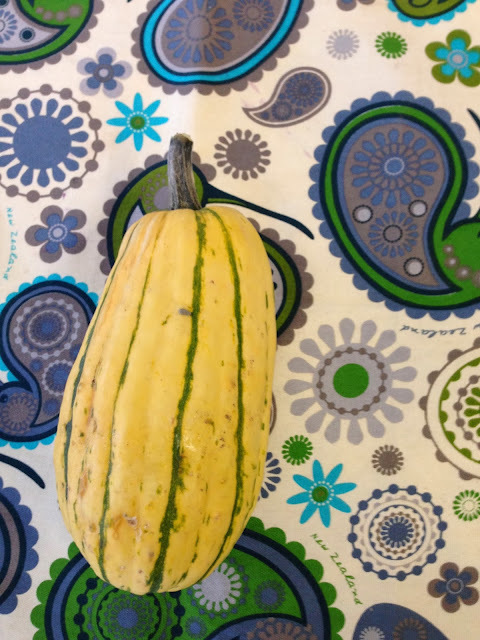 If you can't find delicata squash, you can use another hard winter squash such as butternut or kobocha. 2. Instead of feta cheese, you could use chèvre or parmesan. 3. Instead of lettuce, you could use spinach. 4. Instead of pumpkin seeds, you could use walnuts. 5. Instead of maple syrup, you could use honey or brown sugar. 1. Store each component of the salad separately to keep the salad for a couple of days. I made this the night before and took it to work for a potluck. I just let the squash and dressing come to room temperature first. 2. You will have extra dressing. It will keep in the fridge for about a week. 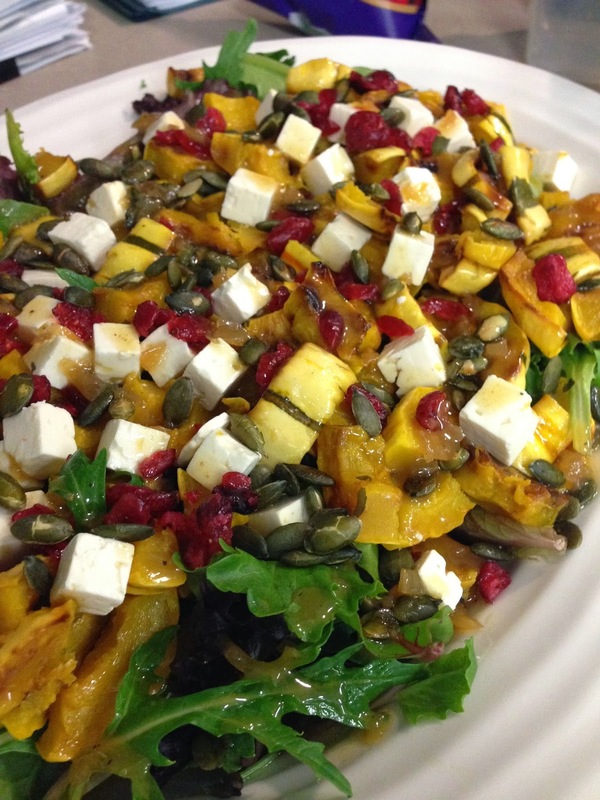 Enjoy this autumn/winter salad for the next couple of months for lunch or as an accompaniment to soup. It's time to admit that there will be a day in the not so distant future where the temperature will be minus 30 before windchill, the snow will be up to your shins, and the last thing you will want to do is leave the house. This recipe is perfect for that day (and any other winter day when you are feeling lazy). 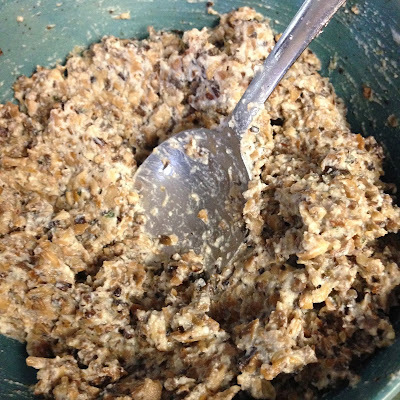 I first made this recipe when Scott and I were living in England. We started out with only a hot plate to cook on, but luckily graduated to a gas range (hob) and oven a couple of months after settling in. I have fond memories of making this dish after a chilly February day of showing my parents around London. I still think of that day every time I make this dish, which is often, and remember my mom's worried look when I was (god forbid) putting garlic, of all things, in the pot. This dish was responsible for helping her get over her fear of garlic just like a few of the previous recipes have been responsible for helping her get over her fear of basil. God only knows what adventures await her next! 1. Put a large, a medium, and a small pot on the stove. Take out a casserole dish. 2. Chop the onion and garlic and put them in the medium pot with the oil, salt, pepper, red pepper flakes, and Italian seasoning. Saute on medium heat for about 8 minutes. 3. Cut the potatoes into bite-sized pieces. (You can leave the skins on). Simmer them in the large pot in salted water until they are tender, about 20 minutes. 4. Add the diced tomatoes with their juice and the tomato sauce to the onion pot and simmer until the sauce is reduced and thicker. Add more salt and pepper, if needed. 5. Rinse the chickpeas under cold water and put them in the small pot. Cover them with water and simmer on medium heat for about 5 minutes until soft. 7. Drain the artichokes and quickly rinse in water, if you want. They are okay if they are not rinsed, but they have a briny flavour. Cut each heart into eighths. Add to the tomato pot when the potatoes are almost done cooking. 9. When the potatoes are finished cooking, drain them and let them sit for a couple of minutes so that all the water is gone. Put them back into the large pot. 10. Drain the chickpeas and add them to the potato pot. 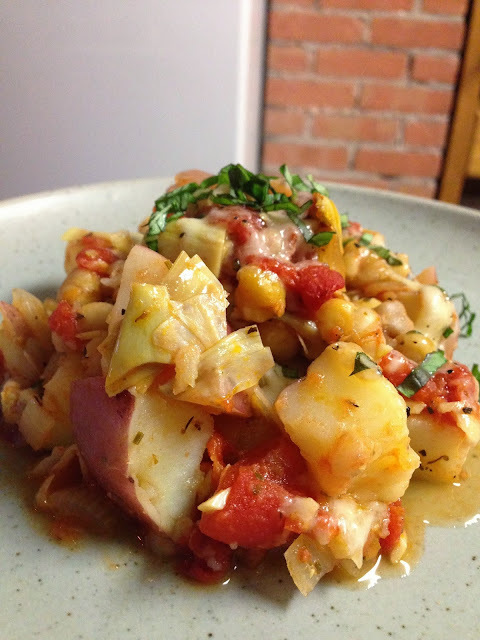 Pour the tomato/onion/artichoke mixture over the potatoes and chickpeas. Stir carefully so that everything is mixed together. 11. Pour everything into the casserole dish and top with the grated cheese. 12. Cook under the broiler for 3-5 minutes until the top is golden brown. Let sit for 5 minutes before serving. Top with fresh basil, if desired. Enjoy! 1. 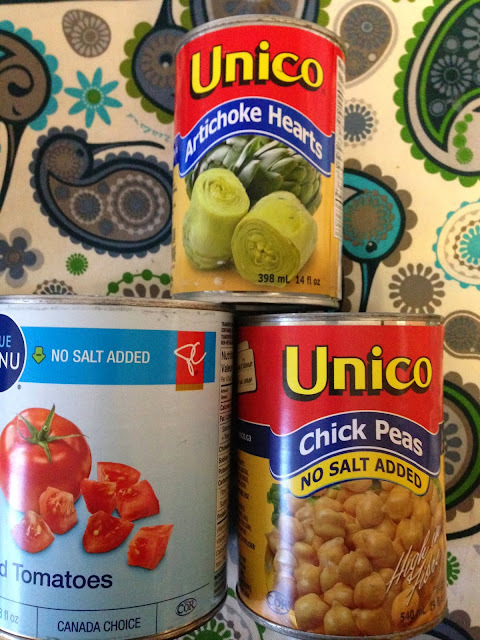 Like I said, this is a great pantry recipe, so buy double the tomatoes, artichoke hearts, and chickpeas so that you have them on hand the next time you want to whip up something from what you have in the cupboard. 1. This recipe is very flexible. It can be made with any kind of cheese except maybe blue cheese. 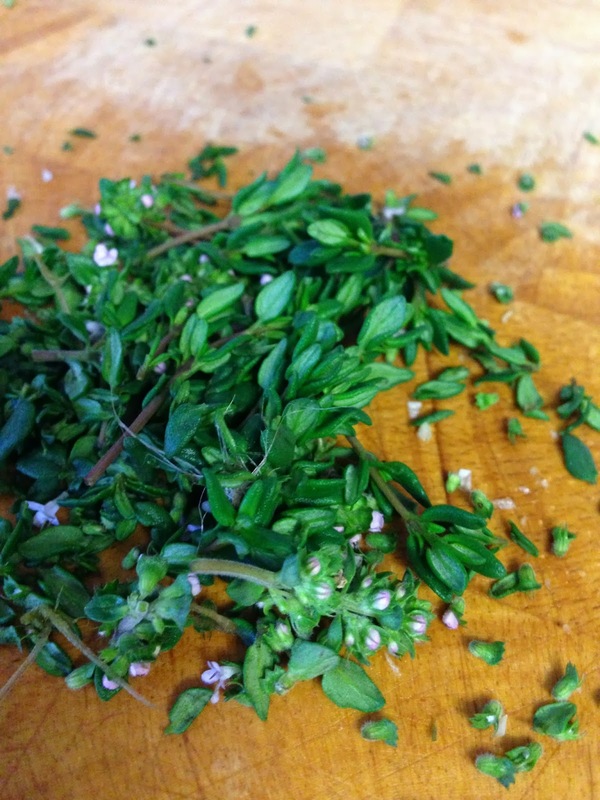 If you don't have Italian herbs, just use dried oregano, dried basil, dried thyme, or a combination of what you have. If you don't have fresh garlic, use garlic powder. The point of this recipe is to use what you have on-hand, so feel free to experiment. 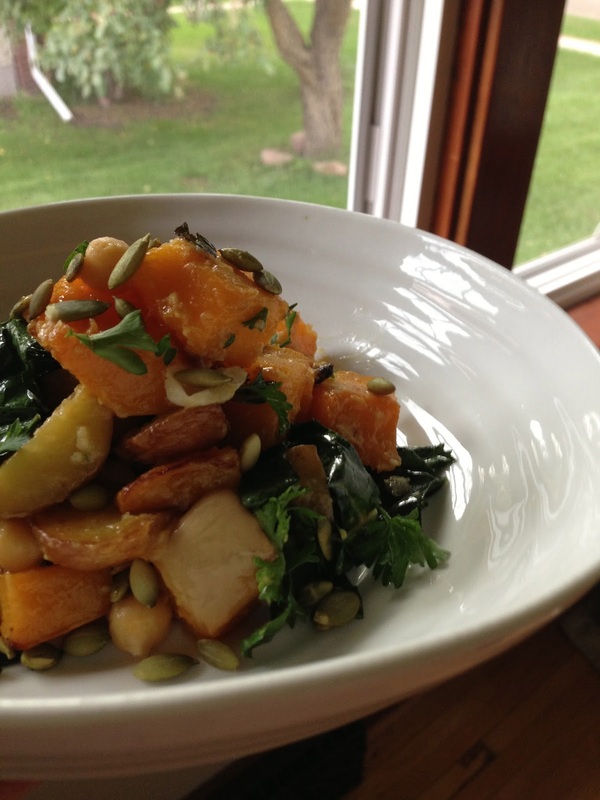 This recipe was inspired by one in Heidi Swanson's book "Super Natural Every Day". I have changed several of the ingredients but kept the four most important components of the dish: the sweet squash, the sour lemon, the salty miso, and the spicy curry paste. Together, they are perfectly balanced so that the squash is not too sweet, the lemon is bright, the miso is barely noticeable, and the curry does not bite. Mom, there will be a few ingredients that are new to you here, but they are well worth the investment. I promise that you will use them again in many future recipes. These are not ingredients that you will use a small amount of and will then sit in your cupboard until they go bad. Also, the green curry is not the kind of curry you don't like. You don't like cumin, and this paste has no cumin in it. Trust me, it is good. 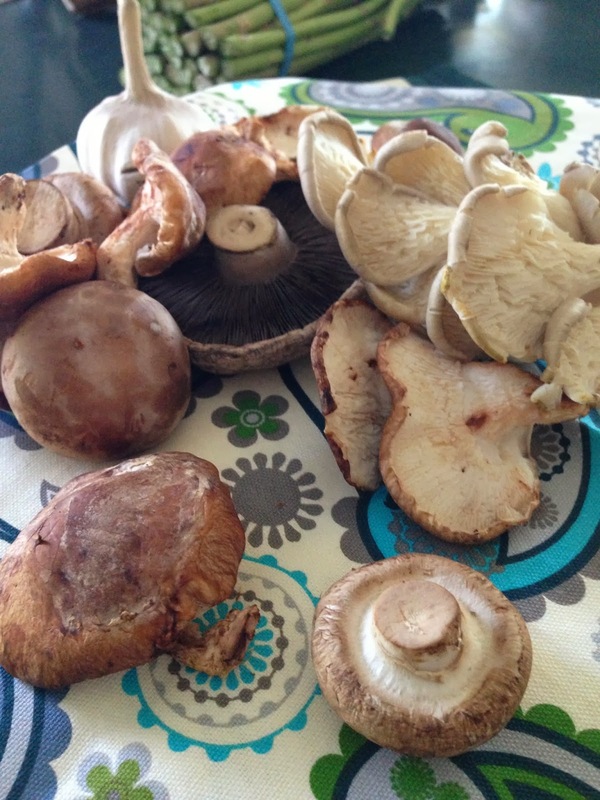 Miso is an amazing ingredient that can be added to many dishes to add that special "umami" flavour. It stimulates the secretion of digestive fluids in the stomach and restores the beneficial probiotics in the intestines. 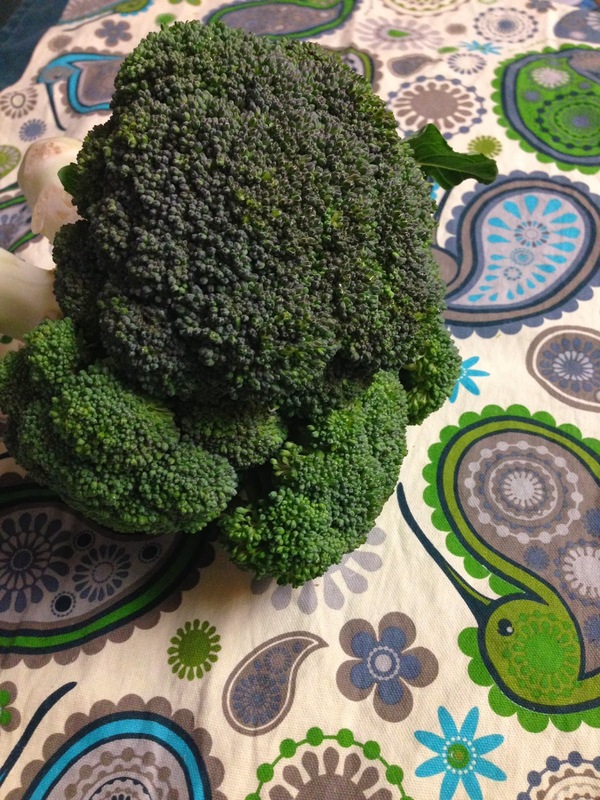 It reduces the risk of several different cancers, is detoxifying, and contains antioxidants. It also strengthens the immune system and helps to lower LDL cholesterol. No wonder many people in Japan eat miso soup for breakfast every day! 2. Cut the squash in half lengthwise and scoop out the seeds (if you are feeling energetic, you can roast them in the oven like pumpkin seeds). Cut the squash into 1/2 inch cubes. You can peel it if you want, but you don't have to. I usually peel half and leave half with the skin on. Fill up the Pyrex cup - that's how much you will use for this recipe. Toss the rest of it in a bit of olive oil and roast it on a separate baking sheet to use at a later date - if you put it in the fridge raw, you will never use it - trust me! 3. Cut the potatoes into cubes. Put the potatoes with the squash in a medium bowl. 4. In a small bowl, whisk together the olive oil, miso, and curry paste. Measure out 1/3 cup of the mixture and put it in the bowl with the potatoes and squash. 5. 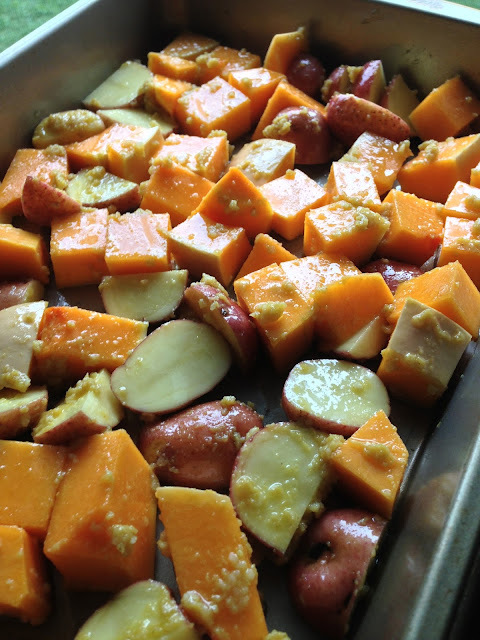 Toss the potatoes/squash with the miso sauce, and then place them on a baking sheet. Put this baking sheet and the baking sheet with the plain (leftover) squash in the oven for 30 minutes. Stir them around at 15 minutes and 25 minutes so that they do not burn. 6. Add the lemon juice to the leftover miso mixture. Cut the stems out of the kale, slice the leaves into ribbons, add them to the miso/lemon mixture, stir to coat completely. 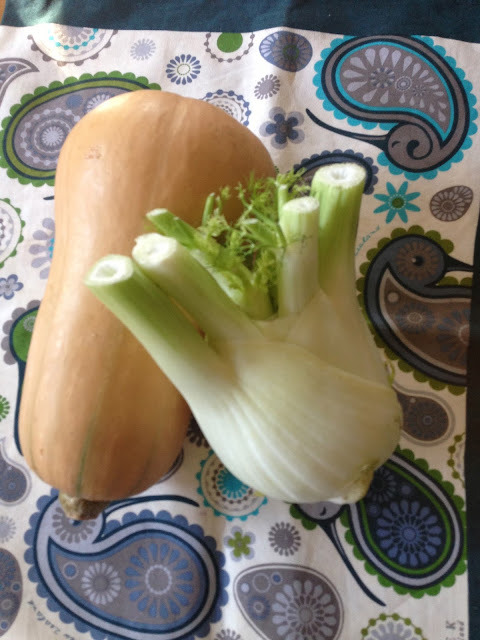 Leave this at room temperature to wilt in the lemon vinaigrette while the squash cooks. 7. Simmer the chickpeas in a small pot of water for about 5 minutes to soften them up a bit. Drain and set them aside until the potatoes/squash are ready. 8. Toast the pumpkin seeds in a dry frying pan for about 2 minutes. Chop the parsley into large pieces. 8. When the potatoes and squash are soft and a fork will easily go through them, take them out of the oven and toss them with the kale mixture. Add the chickpeas. 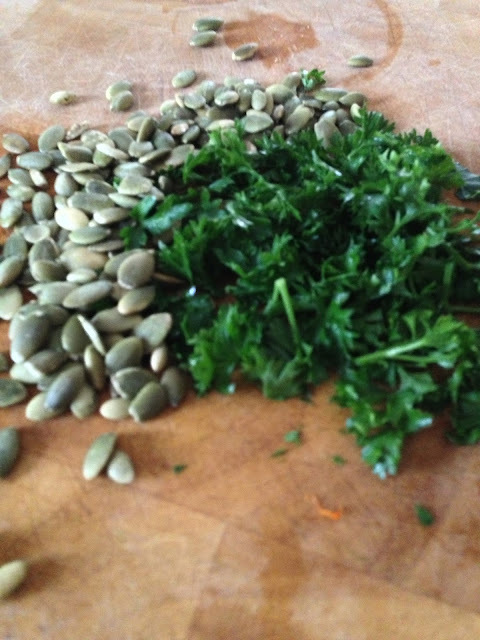 Serve on a plate and top with the pumpkin seeds and parsley (or cilantro). Enjoy! 1. The leftover butternut squash can be eaten alone as a side, added to soups or stews, or pureed with vegetable stock for a nice soup. You could find a muffin recipe that uses a squash puree, or you could freeze it for another use. 2. 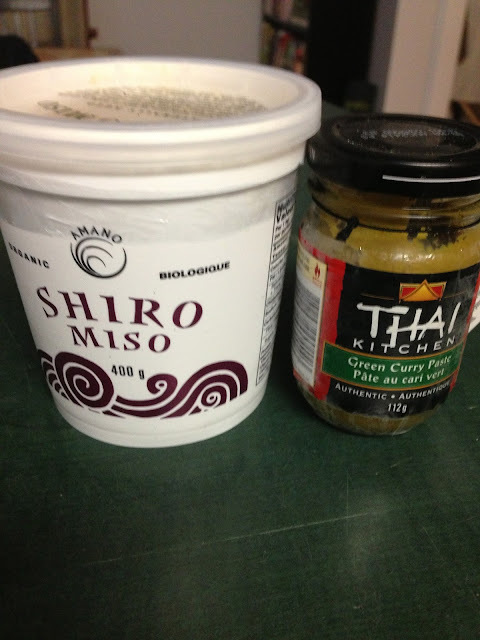 The leftover miso can be used in soups, stews, or just added to hot water for a very nice, light and healthy soup. You can use it with some olive oil and the juice of the other lemon half for a nice vinaigrette. 1. There are many different kinds of squash at the farmers market at this time of the year. You could use another kind if you want, but don't use spaghetti squash - it is too different. 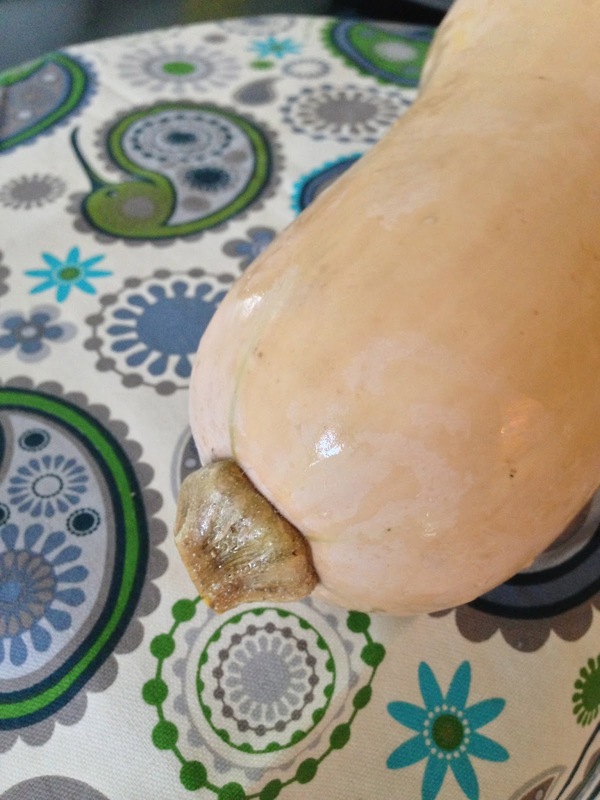 If you use butternut, pick one that has a long skinny part and a small bulb. That way you get more flesh and fewer seeds. 2. The miso will be in the refrigerated section of the health section (you might have to go to a health food store, but I don't think so, it is pretty common). There are different kinds, but you want to make sure that you get white miso as it is the mildest. I use shiro miso. 3. The Thai green curry is in the Asian/Thai section of the grocery store and can be purchased at any grocery store. You can use red Thai curry as an alternative, but I prefer green. Scott gave this recipe an 8/10 and then went back for thirds, so I'm thinking it deserves at least an 8+. . .
P.S. He gives almost everything an 8/10. I'm still trying to figure out what he expects for a 10! When I hear the word "cabbage", memories of limp, stinky boiled cabbage immediately pop into my mind. 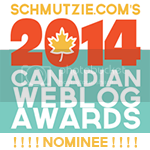 From where, I have no idea since my mom never, ever made boiled cabbage or even cabbage rolls! Fortunately, this recipe is a delicious way to enjoy lightly sautéed cabbage with no offensive odour whatsoever. In addition, the humble cabbage is a super nutritious food that prevents cancer, lowers cholesterol, and helps heal stomach ulcers. This week's recipe was inspired by blogger Heidi Swanson from 101 Cookbooks. The original recipe can be found in her book "Super Natural Every Day". 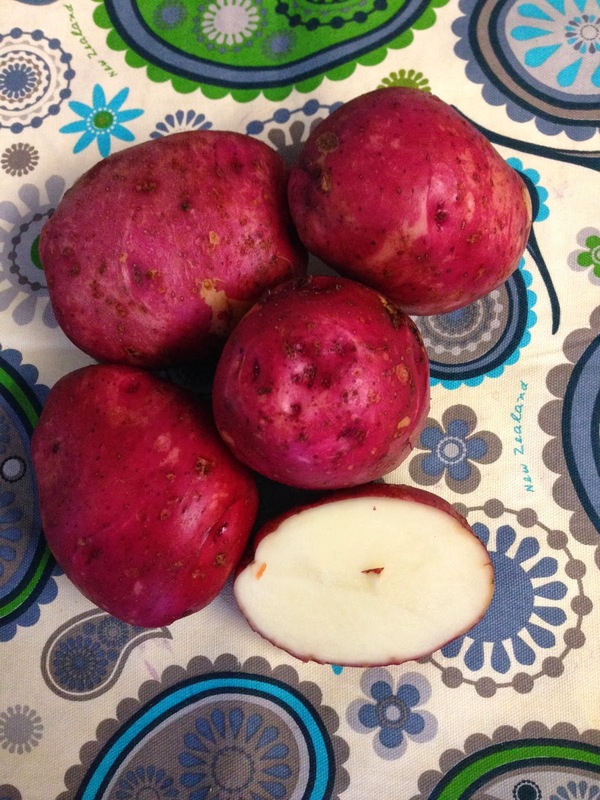 This hash makes a great side dish, or it can be served with a salad for a light dinner. For a vegan option, hold the cheese. Serves four. 1 Tbsp coconut oil, plus more as needed. 1. In a large skillet, melt the coconut oil over medium high heat. Sauté the potatoes and sea salt until the potatoes are cooked through. They should be brown and crispy on a couple of sides. 2. Add the red onion and white beans as well as any oil necessary to continue sautéing until the onions are translucent. If the beans become a bit crispy as well, even better. 3. When the onions are cooked through, add the garlic and sauté for another 30 seconds. 4. 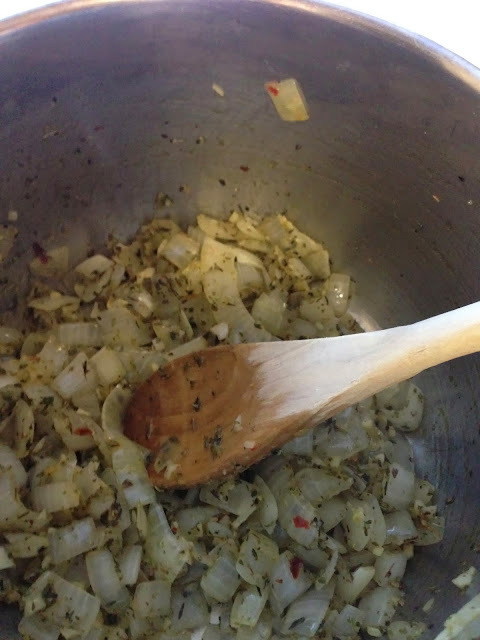 Stir in the cabbage and cook for approximately 3 minutes until it is wilted but still firm. 5. Take the pan off the heat and finish with a sprinkle of dill and the grated parmesan. 6. Season with freshly grated black pepper and more sea salt, if necessary. 1. Coconut oil should be virgin or extra virgin and cold-pressed. It is easy to find now and will be a solid white colour at room temperature. 1. If you don't have coconut oil, you can use canola or extra-virgin olive oil, but the flavour will change. 2. Instead of potatoes, you could use leftover cooked whole grains such as wheat berries, faro, or brown rice. 3. You could use any kind of bean you want, including chickpeas, but again, the flavour will change. 4. And of course, you can use white onions or shallots instead of red onions and red cabbage instead of green. 1. If you have leftover hash, you can fry it up again the next day for breakfast or lunch and serve it with a poached egg on top. The soft yolk from the egg will create a nice sauce. 2. You will probably have leftover cabbage, dill, potatoes, and onion. You can throw these together with vegetable stock, canned diced tomatoes, celery, and carrots for a warming soup. You can even add some barley if you want. 3. 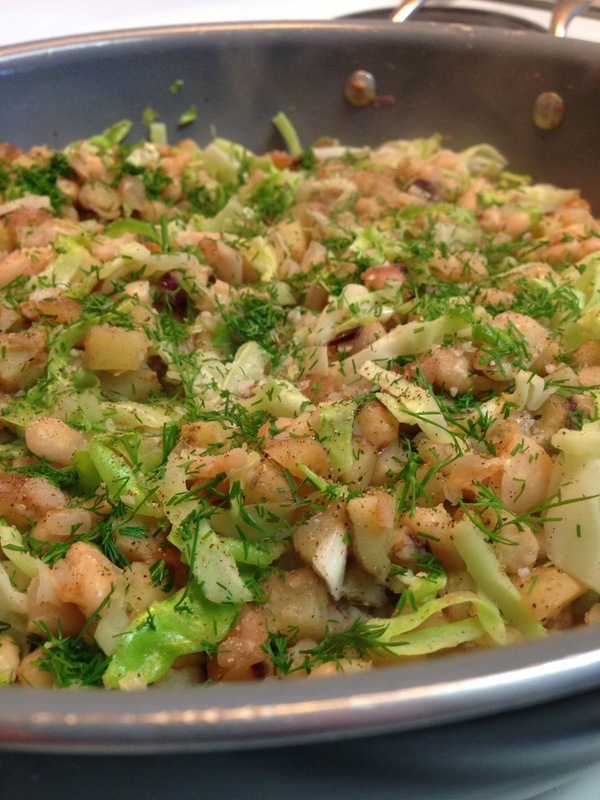 This cabbage hash is also a useful recipe if you already have leftover potatoes in the fridge. 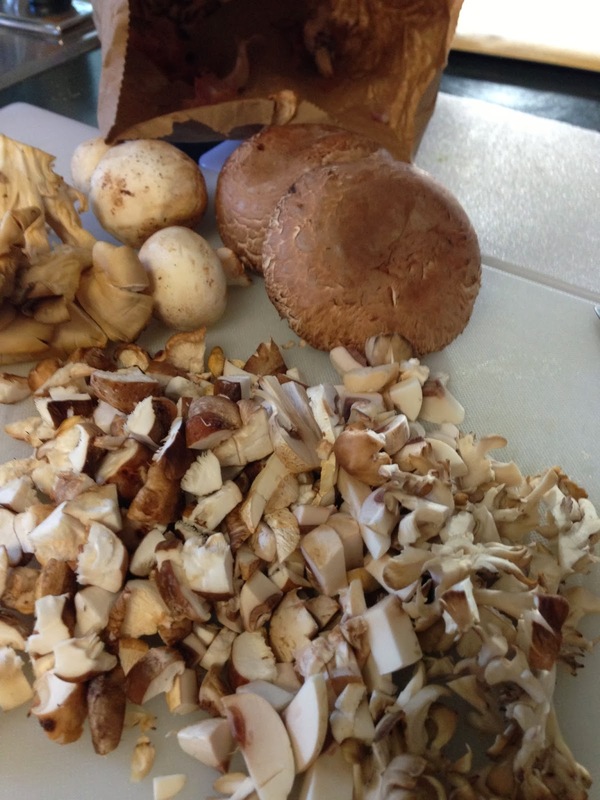 You will probably have to cut them into larger pieces for step one so that they don't turn to mush. Don't worry, it doesn't take four days to make this. A few months ago, I was visiting my parents for the weekend, and made this recipe from the River Cottage Veg cookbook. A few days later, my dad called me and told me that they were eating the leftovers for the fourth day straight, AND that he now likes farro better than brown rice, which is saying a lot, trust me! 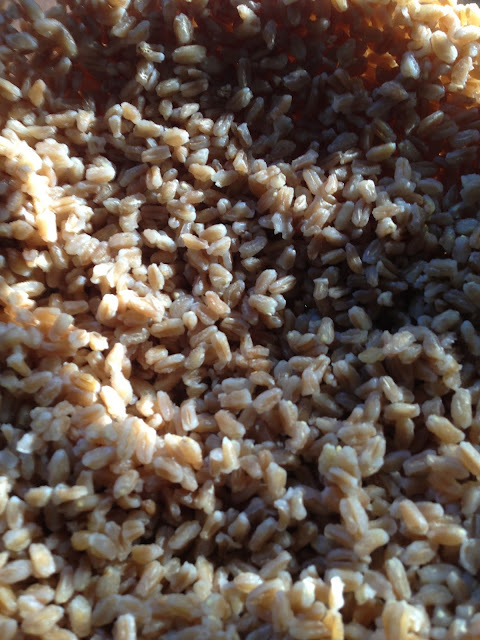 For those of you who are also new to farro, it is an ancient Italian wheat variety. 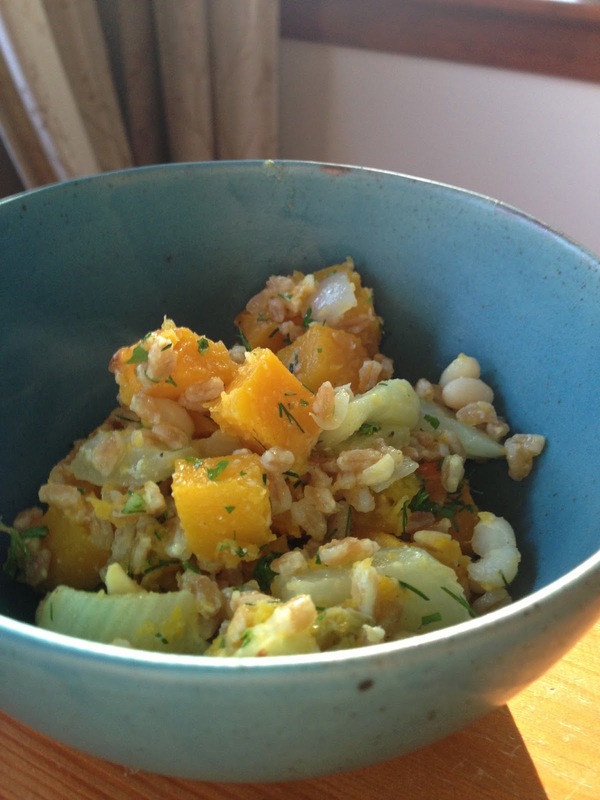 It is chewy and nutty and falls somewhere between brown rice and wheat berries. The recipe below is my variation on the recipe that was initially published in the River Cottage book. You may also want to use the basic structure of the recipe and play around with the vegetables you add depending on the season. In my opinion, this dish is perfect for fall. This recipe serves 6 - 8 generously. 2. 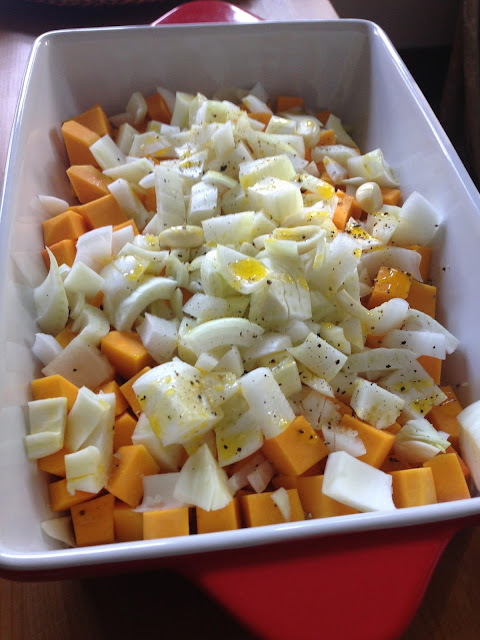 Mix butternut squash, fennel, onion, and garlic with olive oil. Bake for about 30 - 40 minutes stirring part-way throughout. You want it to be caramelized and brown, but not burned. 3. 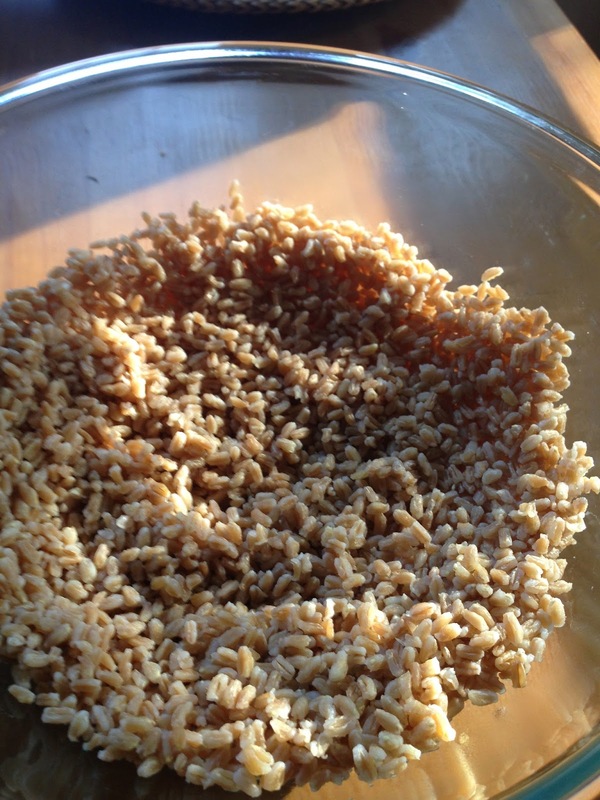 In the meantime, cook the farro in salted water and drain it. It's okay if it sits at room temperature until the squash mixture cooks. Also, if you are using canned beans, heat them through in a pot of water. 4. 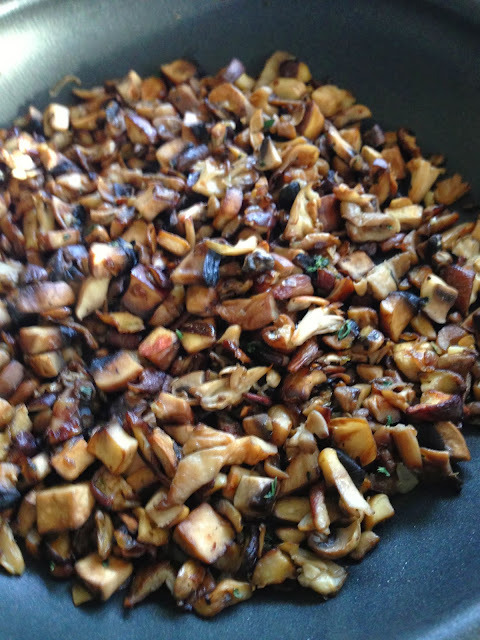 When everything has finished cooking, mix the farro with the mixture out of the oven including any oil/juices in the pan. 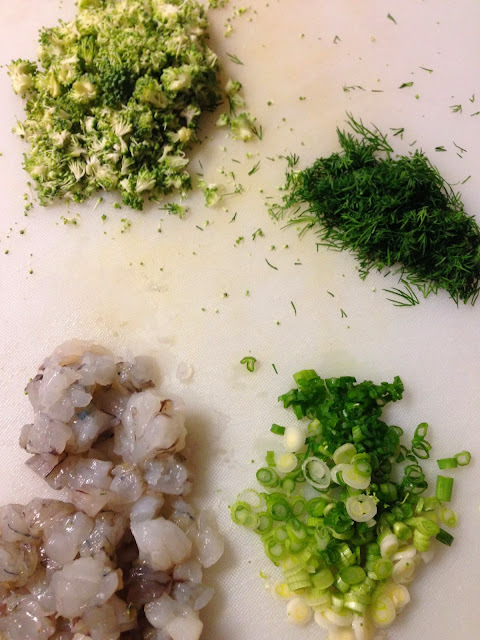 Add the lemon juice, dill, parsley, almonds, parmesan, salt, and pepper and mix thoroughly. Enjoy! 1. I like to add half a golden delicious apple, tossed in lemon juice, that has been finely diced. It adds a really nice crisp freshness that contrasts nicely with the rich cheese. 2. Apparently when my parents got to day four of leftovers, they decided that it was time to change things up a bit, so they added diced yellow peppers that had been roasted on the barbecue. Apparently, the results were pretty fantastic. 1. The best way to buy farro, in my opinion, is in a vacuum-sealed bag/box from an Italian store. When bought this way, it is very inexpensive and fresh. You can also buy it from an organic or health store, but it will be much more expensive. If you buy an imported from Italy brand, buy one that says "semi-perlato or semi-brillato", which means that it is semi-pearled and will cook much more quickly, usually in about 20 - 30 minutes. 2. One of the best kitchen purchases I ever made was my lemon reamer. 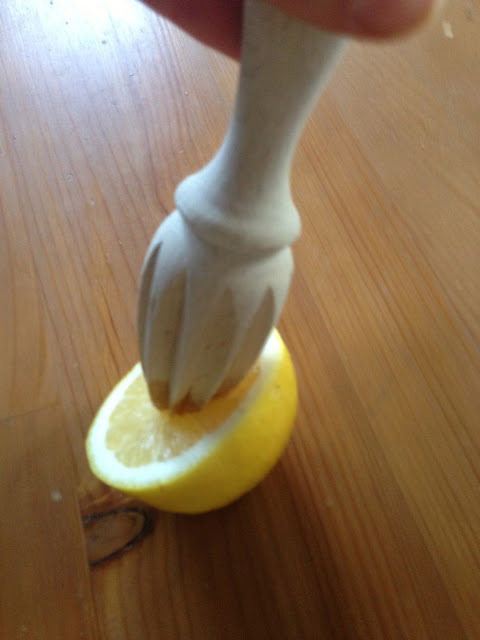 This very inexpensive tool will juice a lemon faster and more effectively than any fancy gadget you can find. 1. Obviously this lasts for quite a while in the fridge. 2. You could also mix in a bit more cheese and some egg, form the leftovers into patties, and shallow fry them. Serve on top of dressed lettuce for a nice lunch. Fall is definitely here, so it is time for soup! Soup is actually one of my favourite parts of fall. It's easy to make, there are an infinite number of variations, it freezes well, and it tastes even better with a piece of crusty bread. 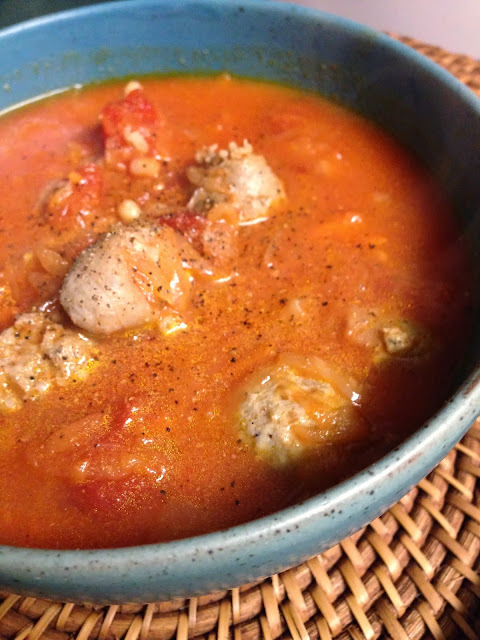 This soup is my favourite way to eat sausage because you can enjoy the flavour without eating a lot of it. It's also one of my favourite ways to eat kale because it melts nicely into the background against the spicy sausage and the sweet potato. 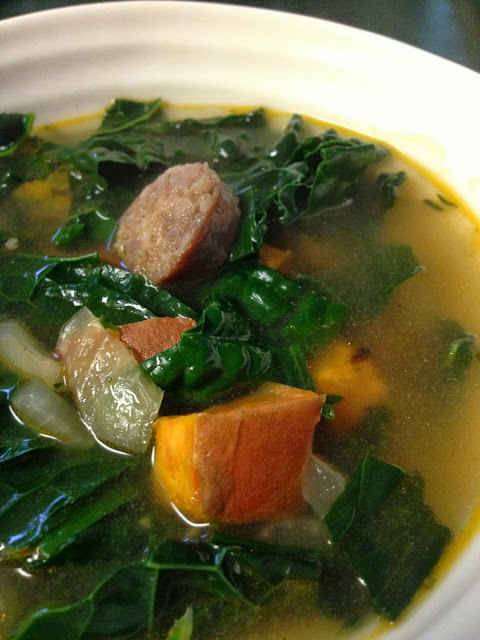 If you're not sure about kale, try it in this recipe, and I guarantee you will like it. This recipe is an adaptation of a Williams Sonoma recipe, and it serves 6 - 8. 2. 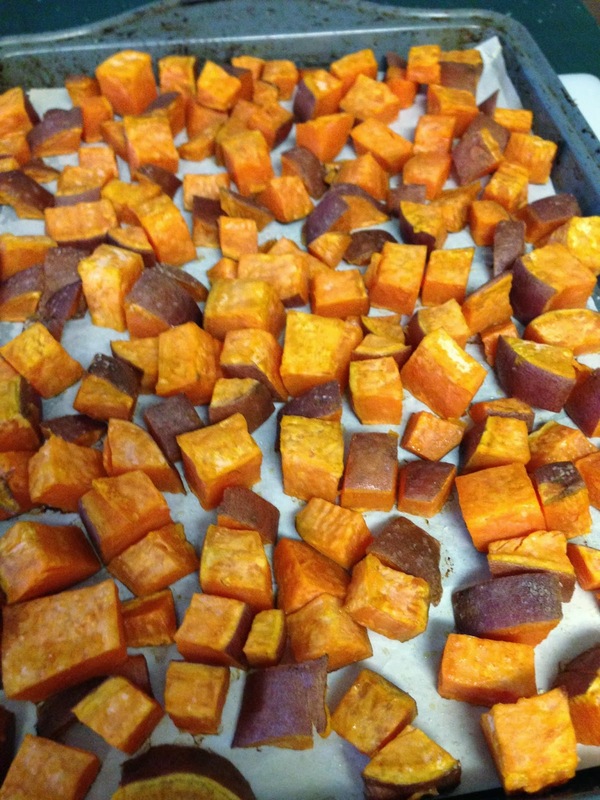 Cut the sweet potato into 1/2 inch cubes. There is no need to peel it. It is more nutritious to leave the skin on, and it is a real pain to peel it. Toss the sweet potato cubes with 1 Tbsp of the olive oil, spread in one even layer on a baking sheet with parchment paper. 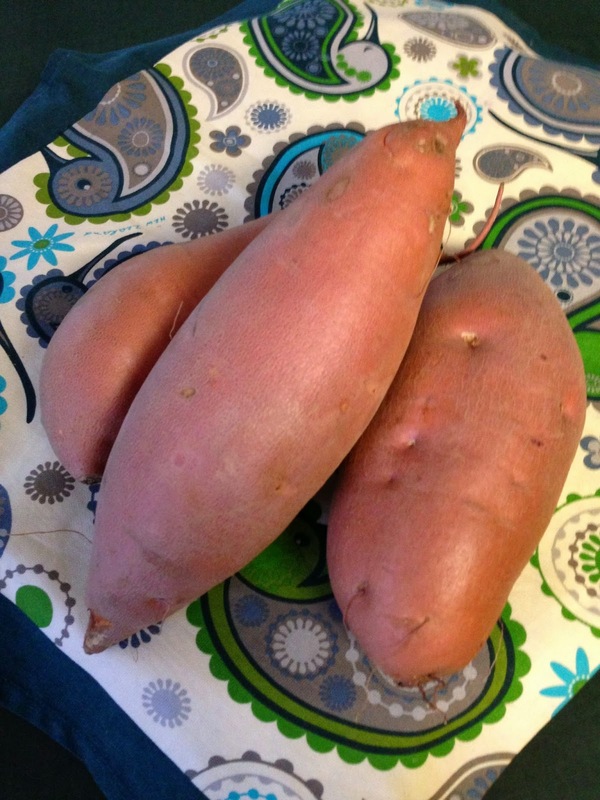 The parchment paper keeps the sweet potato from sticking to the pan. Sprinkle with salt and bake in the oven for 20 minutes. 3. In a large soup pot or dutch oven, heat the remaining 1 Tbsp of olive oil and brown the sausages on all sides. When the sausages are browned, remove from the pan and set aside on a paper towel lined plate. It is not necessary for them to be cooked through. 4. Sauté the onion with a sprinkle of salt until translucent. Add the garlic and thyme and sauté for another minute. 5. Slice the sausage into coins and return them to the pot. Add the chicken stock, heat to a boil, and cook on a low simmer for another 10 minutes. 6. 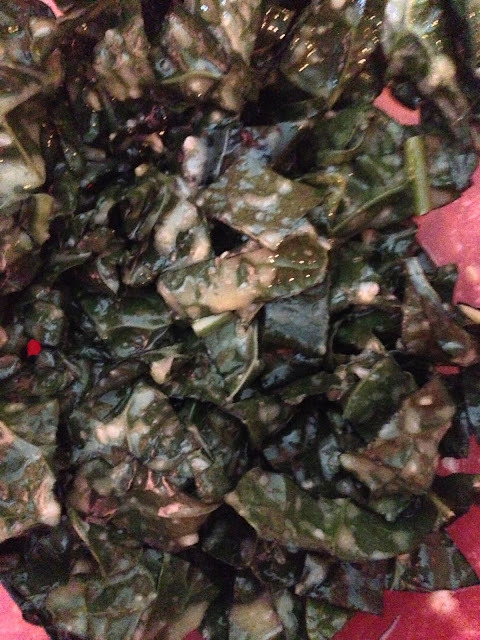 Remove the kale leaves from the inner ribs and chop into one inch pieces. Add to the pot with the roasted sweet potato and heat through for about 2 minutes. 7. Season with pepper and additional salt, if needed. I added about another teaspoon of salt. 1. It is important to use a good quality chicken stock because you will really taste it in this recipe. If I am not using homemade, I prefer to use an organic boxed variety. 1. I really encourage you to try this with kale at least once, but you can make it with spinach if you prefer. 2. You could make this with chicken sausage, but it is really best with something spicy, so add some crushed red pepper flakes when sautéing the onions. Don't forget to use vegetable stock instead of chicken stock if you want this to be vegan. The hot afternoons and cool evenings make it a perfect time to dust off the old soup pot. Happy September!